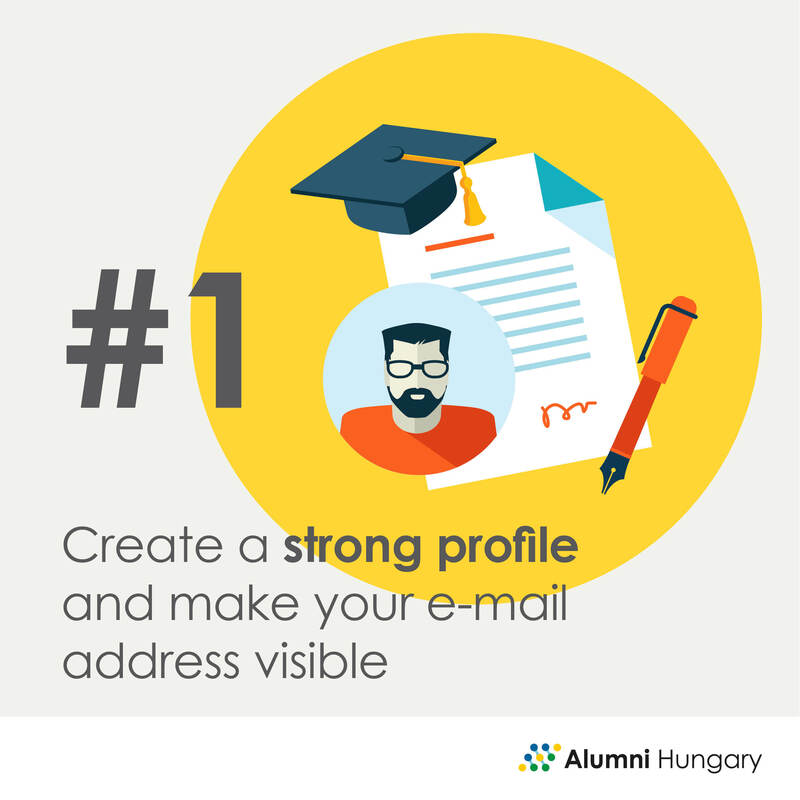 However, these are just a few examples in which the Alumni Hungary portal can support your professional career and development, no matter where you are in the world. But how exactly can you do that on the portal? After you have completed your registration and filled out all mandatory fields, you become a full member of the Alumni Hungary Network. From this point, you are able to use all services of the website and you will appear in the Alumni members list, which can be browsed by all registered user, so people are able to view your profile and contact you on other platforms. If you want others to find you, you should make your e-mail address visible for other users. You can do that under the User edit menu, in the e-mail address section on your alumni profile. This is a very important step, so do not leave it out. You can also create your own Contact listwhere you can Follow those members who are interesting for you for some reason: former university fellows, people with the same professional background, successful alumni do you want to contact in the future, etc. Building a powerful contact list takes frequent browsing, and you have to set a networking goal too. Our community is constantly growing, so you can never know when you will find new and valuable contacts, so be an active and recurrent member. In addition, there is a plus: if you follow somebody, you get an e-mail notification every time she/he creates a new group or event, so it is a really useful tool. Every activity you start and run on the portal is embedded in a community focused context, because this is the main goal of the portal: establishing communities that are constantly developing and growing. 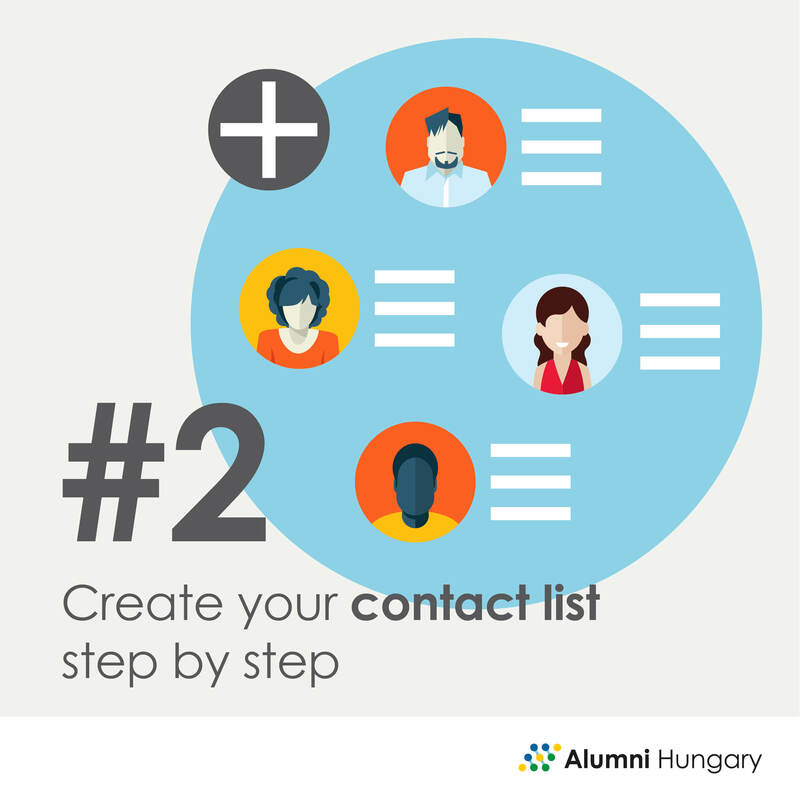 Therefore, despite the fact you cannot contact other alumni members directly via the Alumni Hungary Portal, you have another great chance to start conversations and debates on the platform: through Groups. You can create as many as you want, but staying relevant is highly important. Moreover, as a group owner, you have to keep the level of the conversation up with the help of Forum topics that you can create under the Nodes menu in your group. The great thing is that every member of the group can add such topics, so the more member you have, the more interesting it gets. Then it is time to meet these people in real-life for further conversations and experience-exchange. Start this journey in your home town or residence city. Create local alumni meetings where you can meet like-minded people with the aim of professional development or just to have a good time. Of course do not forget to publish the events on the portal. Search for alumni members from the same country or city to see how many potential participants you have. After a short assessment, we give you our feedback. Nevertheless, you can also share your work and publications in the Groups, so do not hesitate! Hopefully these few tips will help you bring out the most of your Alumni Hungary membership. If you still have questions please browse our Frequently Asked Questions section, or write us an e-mail.